First make the Creamy Rémoulade by simply taking a medium-sized bowl out and mixing all the ingredients together in it. Cover the bowl and leave it in the fridge until the pickle slices have been fried. Take a large Dutch oven out and pour enough oil in to create a depth of 3 inches. Heat the oil to 360 degrees. Add eggs and buttermilk to a shallow dish, whisking to combine. Take another shallow dish out and add the following ingredients to it, stirring to combine: cornmeal mix, flour, red pepper, garlic powder, salt and black pepper. Take the pickle slices and dip them into the buttermilk mixture, shaking any excess mixture off before placing it in the cornmeal mixture, tossing to coat. Add the pickle slices in batches to the oil, frying for 3 to 4 minutes or until they’re golden brown. Take them out of the oil and let them drain on a paper towel-lined plate. Eat immediately with the Creamy Rémoulade. This is an addictively delicious snack to have ! The crunchy batter on this is what you dream of for fried food and potato chips and the fried pickle tastes really good with the Creamy Rémoulade (which actually tasted like a more flavorful version of tartar sauce to us). 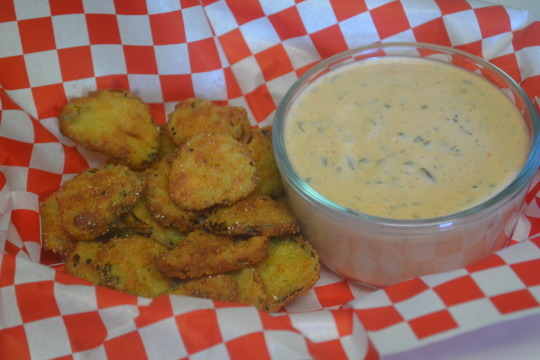 If you know someone who doesn’t like pickles, this recipe could actually change their mind ! We got this recipe from Paula Deen’s magazine. We weren’t paid in any form to promote White Lily, Mt. Olive, Zatarain’s, Frank’s RedHot, or Paula Deen’s magazine.